Rabat -- Morocco has accumulated a rich experience in the fight against poverty and exclusion, said Mohammed Mohattane, Secretary of State in Charge of Rural Development, in a workshop session on the philosophy of the National Initiative for Human Development, organised here on Friday. He added that the 2020 strategy for rural development is at the heart of the NIHD, as it completes its orientations and implement its programmes. Speaking at Friday's meeting, organised by the Ministry of Social Development, Family and Solidary, at the Minsistry of Equipement's conference center in Rabat, Lahcen El Omrani, advisor of the Minister of Social Development, said that “more than 50% of the state's budget is earmarked to the social sector; yet, more than 4 million people- a total of 700,000 households- live in poverty, exclusion and poor housing. Besides, two million children still don't benefit from schooling.” He also added that 30% of young degree-holders suffer unemployment. “This has prevented millions of Moroccans from making full use of their potential and from contributing effectively to the country's social and economic life,” stressed El Omrani. 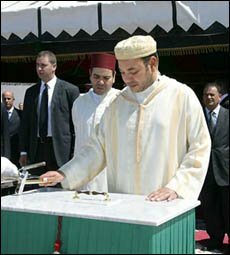 The National Initiative for Human Development, launched by HM King Mohammed VI on May 18, 2004, falls within the framework of the King's vision for building a society based on the principles of political democracy, economic efficiency, social cohesion and hard work. It is also intended to encourage all citizens to make full use of their potential. The launching of this initiative also illustrates the sovereign's concern to combat illiteracy, poverty and slums. The Initiative was launched to free disadvantaged populations and regions from the yoke of poverty, exclusion and backwardness, which constitute a real challenge lying ahead for Morocco. Expected to cost MAD 1.0 billion ($114.3m) a year, the programme will provide basic infrastructure to millions of poor Moroccans, from adequate housing and drinking water to health care and education. The first stage of the programme will seek to speed up the social upgrading of 360 communities from among the poorest in the rural world, in addition to 250 poor districts in cities and suburbs, old medinas and shanty towns, where the ills of social exclusion, unemployment, delinquency and destitution are most felt. It will also progressively target the upgrading of both the capacities and the quality of the existing reception centres, or the creation of new specialised centres, capable of accommodating and providing assistance to the people in a situation of great precarity. This social workshop stems from the lessons drawn from the past experiences and the models that proved reliable in certain countries, in such matters as the fight against poverty and exclusion. HM King Mohammed VI has recently chaired the signing ceremonies of projects to be carried out in M'diq and surrounding areas (northern Morocco) to contribute to the development of the region as part of the National Initiative for Human Development (INDH). Two conventions bear on the fisheries sector, notably the extension of M'diq port and the support of the traditional fishery activities. A third convention concerns a tourism development program in the M'diq-Fnideq coast. The three-year program aims at making the region a national and international tourism destination. This innovative initiative seeks to upgrade and reinforce social actions to enable Morocco to mobilize all its energies and integrate them in the battle of comprehensive development and, consequently, fulfill aspirations nurtured in this new era for democracy, social justice and the preservation of the dignity of men and women.